At this time of year we start thinking more and more about the world outside our window. 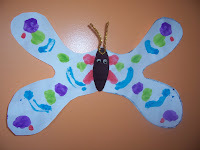 A very popular craft and theme at this time is butterflies. I have a couple I want to show, but I will do it in two different posts. construction paper, scissors, paint, glue, and decorative items. 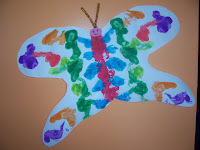 First you will need to take a piece of paper, fold it in half, and draw a pattern of a butterfly. 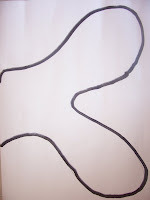 Depending on your preschoolers scissors skills the pattern can be as basic or intricate as you like. 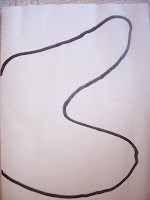 After you have drawn the pattern, have the child cut it out, remember to keep the paper folded. 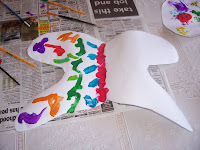 Then after it is cut they will open it up and tah-dah-they have a butterfly--wings the same on both sides. But of course, a butterfly needs to be beautiful. This is where the paint comes in. 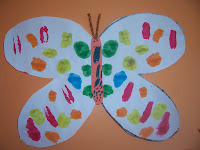 Have the child put paint on half of the butterfly--it helps to fold back the other wing so they can't see it. When they have made the desired effect, fold the two sides together and have them help you press like an iron. Then open the butterfly and see the beautiful patterns that were made--the same on both sides. After the paint has dried, it's time to add the body. I used some different things, paper, felt, tongue depresser, markers, wiggle eyes, pipe cleaners, etc. You can use anything your heart desires. 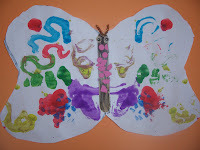 Your done--now you have created a beautiful butterfly garden to have in your home.